Music therapists treat and rehabilitate people with mental, physical, and emotional disabilities. They use the creative process of music in their therapy sessions to determine the underlying causes of problems and to help patients achieve therapeutic goals. The specific objectives of the therapeutic activities vary according to the needs of the patient and the setting of the therapy program. There are over 5,000 music therapists employed in the United States. Creative arts therapy programs are fairly recent addi­tions to the health care field. Although many theories of mental and physical therapy have existed for centuries, it has been only in the last 70 years or so that health care professionals have truly realized the healing powers of music and other forms of artistic self-expression. According to the American Music Therapy Association (AMTA), the discipline of music therapy began during World War I, when amateur and professional musicians visited veteran’s hospitals to play for the thousands of veterans who were being treated for both physical and emotional maladies caused by the war. Health admin­istrators and physicians recognized that the music posi­tively affected their patients, and music therapists were hired to formally work with patients. The field of music therapy advanced further during and after World War II, when the Department of Veterans Affairs (VA) devel­oped and organized various music and other creative arts activities for patients in VA hospitals. These activities had a dramatic effect on the physical and mental well-being of the veterans, and music and other creative arts thera­pists began to help treat and rehabilitate patients in other health care settings. As music therapy grew in popularity, it became evi­dent that formal training was needed for music thera­pists to be most effective. The first music therapy degree program in the world was founded at Michigan State University in 1944. Today, there are more than 70 AMTA-approved music therapy programs in the United States. In 1998, the AMTA was founded as a result of a merger between the National Association for Music Therapy and the American Association for Music Therapy. Its over­sight of educational programs ensures the professional integrity of music therapists working in the field. Similar to dreaming, creative arts therapy taps into the subconscious and gives people a mode of expression in an uncensored environment. This is important because before patients can begin to heal, they must first identify their feelings. Once they recognize their feelings, they can begin to develop an understanding of the relationship between their feel­ings and their behavior. Music therapists use musical lessons and activities to improve a patient’s self-confidence and self-awareness, to relieve states of depression, and to improve physical dexterity. For example, a music therapist treating a patient with Alzheimer’s disease might play songs from the patient’s past in order to stimulate long- and short-term memory, soothe feel­ings of agitation, and increase a sense of reality. A musical ther­apist treating a patient with a physical disability may have the patient play a keyboard or xylo­phone to improve their dexterity or have them walk to a musical selection to improve their bal­ance and gait. Music therapists also treat people with mental health needs, learning and devel­opmental disabilities, physical disabilities, brain injuries, con­ditions related to aging, alcohol and drug abuse problems, and acute and chronic pain. The main goal of a music therapist is to improve the client’s physical, mental, and emotional health. 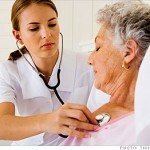 Before therapists begin any treatment, they meet with a team of other health care professionals. After determining the strengths, limitations, and interests of their client, they create a program to promote positive change and growth. The music therapist continues to confer with the other health care workers as the program progresses and adjusts the program according to the client’s response to the therapy. Patients undergoing music therapy do not need to have any special musical ability or be open to one par­ticular musical style. Of course, the patient’s personal therapy preferences, physical and mental circumstances, and his or her taste in music (such as a fondness for rap, classical, or country music) will all affect how the music therapist treats the patient. Music therapists work with all age groups: young chil­dren, adolescents, adults, and senior citizens. They work in individual, group, or family sessions. The approach of the therapist, however, depends on the specific needs of the client or group. Some music therapists may also edit or write publica­tions about music or creative arts therapy, teach music therapy education courses at colleges and universities, work as professional musicians, or specialize in other creative arts therapy careers such as art, dance, or drama therapy. To become a creative arts therapist, you will need a bach­elor’s degree, so take a college preparatory curriculum while in high school. You should become as proficient as possible with music, musical instruments, and musical theory. When therapists work with patients, they must be able to concentrate completely on the patient rather than on learning how to use tools or techniques. A good starting point for an aspiring music therapist is to study piano or guitar. In addition to courses such as drama, music, and Eng­lish, you should consider taking introductory classes in psychology. Also, communications classes will give you an understanding of the various ways people communi­cate, both verbally and nonverbally. 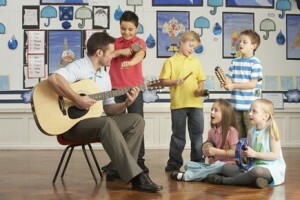 To become a music therapist you must earn at least a bachelor’s degree in music therapy. There are more than 70 AMTA-approved college and university music therapy programs in the United States. Typical courses in a bache­lor’s degree program in music therapy include professional music therapy, music therapy theory, assessment, evalua­tion, populations served, ethics, and research and clinical interventions. Undergraduates will also take supporting courses in music, psychology, and human physiology. In most cases, however, you will also need a graduate degree to advance in the field. Graduate school admis­sions requirements vary by program, so you would be wise to contact the graduate programs you are interested in to find out about their admissions policies. For some fields, you may be required to submit a portfolio of your work along with the written application. The AMTA pro­vides a list of schools that meet its quality standards at its Web site, http://www.musictherapy.org/. In graduate school, your study of psychology and music will be in-depth. Classes for someone seeking a master’s in music therapy may include group psycho­therapy, foundation of creativity theory, assessment and treatment planning, and music therapy presentation. 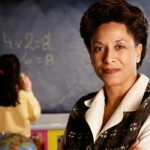 In addition to classroom study, you will complete an intern­ship or supervised practicum (that is, work with clients). Depending on your program, you may also need to write a thesis or present a final artistic project before receiving your degree. Students who receive a bachelor’s degree in music ther­apy are eligible to sit for a certification examination offered by the Certification Board for Music Therapists. Therapists who successfully complete this examination may use the designation, music therapist-board certi­fied. Music therapists are required to renew this certifica­tion every five years by completing continuing education credits or by retaking the certification exam. Many music therapists hold additional licenses in other fields, such as social work, education, mental health, or marriage and family therapy. In some states, music thera­pists need to be licensed depending on their place of work. For specific information on licensing, you will need to check with your state’s licensing board. Music therapists are also often members of other professional associations, including the American Psychological Association, the American Association of Marriage and Family Therapists, and the American Counseling Association. To succeed as a music therapist, you should have a back­ground in and a love of music. You should also have a strong desire to help others seek positive change in their lives. You must be able to work well with other people— both patients and other health professionals—in the development and implementation of therapy programs. You must have the patience and the stamina to teach and practice therapy with patients for whom progress is often very slow because of their various physical and emotional disorders. A therapist must always keep in mind that even a tiny amount of progress might be extremely significant for some patients and their families. A good sense of humor is also a valuable trait. To learn more about careers in music therapy, visit the Web site of the AMTA. Talk with people working in the music therapy field and try to arrange to observe a music therapy session. Look for part-time or summer jobs, or volunteer at a hospital, clinic, nursing home, or any of a number of health care facilities. You might also consider becoming a student member of the AMTA. As a mem­bership benefit, you will receive association publications such as the Journal of Music Therapy and Music Therapy Perspectives. A summer job as an aide at a camp for disabled chil­dren, for example, may help provide insight into the nature of music therapy, including both its rewards and its demands. Such experience can be very valuable in deciding if you are suited to handle the inherent frustra­tions of a therapy career. According to the AMTA, it represents more than 5,000 music therapists who are employed in the United States. They usually work as members of an interdisciplinary health care team that may include physicians, nurses, social workers, psychiatrists, and psychologists. Although often employed in medical and psychiatric hospitals, therapists also work in rehabilitation centers, nursing homes, day treatment facilities, shelters for battered women, pain and stress management clinics, children’s homes, substance abuse programs, hospices, and cor­rectional facilities. Others maintain their own private practices. Some music therapists work with children in grammar and high schools, either as therapists or as music teachers. 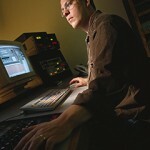 Others teach or conduct research in the creative arts at colleges and universities. Unpaid training internships or assistantships that students complete during study for a bachelor’s degree in music therapy often can lead to a first job in the field. Graduates can use the placement offices at their colleges or universities to help them find positions in the field. AMTA members can also access a list of job openings at the association’s Web site. Music therapists who are new to the field might con­sider doing volunteer work at a nonprofit community organization, correctional facility, or neighborhood asso­ciation to gain some practical experience. Therapists who want to start their own practice can host group therapy sessions in their homes. Music therapists may also wish to associate with other members of the alternative health care field in order to gain experience and build a client base. With experience, music therapists can move into super­visory, administrative, and teaching positions. Often, the supervision of interns can resemble a therapy session. The interns will discuss their feelings and ask questions they may have regarding their work with clients. How did they handle their clients? What were the reactions to what their clients said or did? What could they be doing to help more? The supervising therapist helps the interns become competent music therapists. Salaries for music therapists vary based on experience, level of training, and education. Music therapists earned average annual salaries of $38,816 in 2004, according to the AMTA. The American Medical Association reported the overall median annual salary for music therapists working full time was $42,364. According to MENC: The National Association for Music Education, music therapists earn the following annual salaries based on employment setting: hospital-psychiatric facility, $20,000 to $62,000; special education facility, $22,000 to $42,000; clinic for disabled children, $15,000 to $70,000; mental health center, $21,000 to $65,000; nursing home, $17,000 to $65,000; correctional facility, $23,000 to $58,000; and private practice, $18,000 to $77,000. Music therapists in private practice must provide their own benefits, including health insurance. Music therapists work a typical 40-hour, five-day work­week; at times, however, they may have to work extra hours. The number of patients under a therapist’s care depends on their specific employment setting. Although many therapists work in hospitals, they may also be employed in such facilities as clinics, rehabilitation centers, children’s homes, schools, and nursing homes. Some therapists maintain service contracts with several facilities. For instance, a therapist might work two days a week at a hospital, one day at a nursing home, and the rest of the week at a rehabilitation center. This type of work arrangement entails frequent travel from location to location to see patients. Most buildings are pleasant, comfortable, and clean places in which to work. Experienced music therapists might choose to be self-employed, working with patients in their own studios. In such a case, the therapist might work more irregular hours to accommodate patient schedules. Other therapists might maintain a combina­tion of service contract work with one or more facilities in addition to a private caseload of clients referred to them by other health care professionals. Whether thera­pists work on service contracts with various facilities or maintain private practices, they must handle all of the business and administrative details and worries that go along with being self-employed. The AMTA predicts a promising future for the field of music therapy. Demand for music therapists will increase as medical professionals and the general public become aware of the benefits gained through music therapy. Although enrollment in college therapy programs is increasing, new graduates are usually able to find jobs. In cases where an individual is unable to find a full-time position, a therapist might obtain service contracts for part-time work at several facilities. Job openings in facilities such as nursing homes should continue to increase as the elderly population grows over the next few decades. Advances in medical technology and the recent practice of early discharge from hospitals should also create new opportunities in managed care facilities, chronic pain clinics, cancer care facilities, and hospices. The demand for music therapists should con­tinue to increase as more people become aware of the need to help disabled and ill patients in creative ways.